John Foyston's column today reminds us that among the many beer-related things to do this weekend, EastBurn offers you the opportunity to try three interesting brews from new Salem-area brewers Gilgamesh. 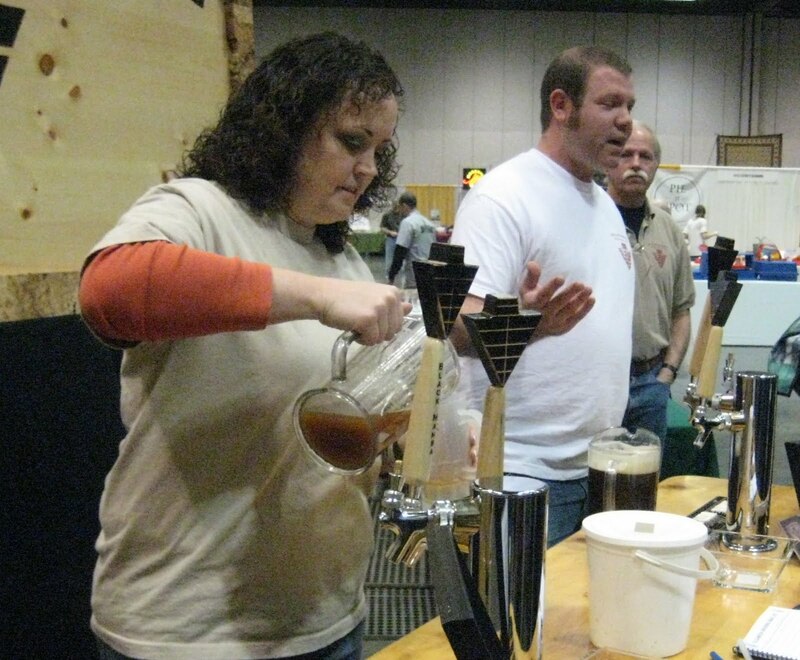 Their hop-free Black Mamba, flavored with black tea, deservedly won the People's Choice Award at the Spring Beer and Wine Fest, and was also a hit with the critics. That's Black Mamba in the pitcher in the picture -- doesn't it look chunky and nutritious? It's definitely off the beaten path, and a well-done beer -- malty flavor with a light body, and a hint of tea and bergamot in the palate. Gilgamesh was also pouring their IPA at the SBWF. It was interesting to discuss it with some of the other Portland beer snobs at the fest -- opinion was pretty evenly split between those who thought it was a nice, balanced alternative to mega-IBU hop bombs and those who thought it was muddled and boring. Put me in the latter camp. It reminded me of a beginner's homebrew: nice try, not infected, but not much flavor. Try it yourself at EastBurn and see what you think. They're also bringing a lightly-hopped 8% Scotch Ale. The EastBurn event starts at 6 PM Saturday, April 17, and will feature Black Mamba, the IPA, and the Scotch Ale. Should be interesting, if you're not beered out after the Firkin Fest and/or Migration grand opening. Thanks for the post! Please note that Gilgamesh Brewing will be serving THREE types of beer at the East Burn on Saturday - Black Mamba, IPA, and HopScotch. There was some confusion on what we would bring and we apologize for this. We wish you would have enjoyed our IPA more, but we appreciate your feedback! What's with the Shallon hate? I agree the website needs some work, but I'm not sure how you could rate the wines unpalatable. Niche perhaps, but quite good in there own right. Plus, Paul is a really good guy and worth visiting for his stories alone. Show some love. Thanks, Lani! I corrected the post. Would you shoot me an email if you deliver a chocolate or cranberry beer to Portland soon? The IPA didn't grab me, but some other very discerning people liked it a lot. You win some, you lose some. @Sláinte Mhaith: I don't hate Shallon, in fact I love them for letting me put a link to the Monty Python Australian Wines bit. That said, those Shallon wines are terrible. Only for real emetic fans, as Eric Idle would say. My parents were enthralled when they visited Shallon one time, and inflicted one of his chocolate wines on me (chocolate mint? maybe it was the orange one). The thing that impressed them the most was that the wine samples were served in little ice-cream cones -- pardon me, I just threw up in my mouth a little. Then they left an entire bottle of that ridiculous cranberry-whey wine at my house. Not even yours truly could finish it, and I'll drink anything. Hmmm, a blog post giving a negative review to a beer lots of others seem to like and disparaging a winery lots of others seem to like (e.g., Dave Knows, Mile73, Yelp, Google). Dr. Wort, is that you? The sources Anon cited for Shallon aren't "lots of people". Dave Knows and Mile 73 are engaged to be married. So are yelp and google. Dave didn't say he liked the wine; Mile 73 did, but she also said she enjoyed the chocolate wine poured over pound cake, which doesn't exactly recommend it to me as a wine. The 6 reviews on each of yelp and google show no evidence of having been written by people with a passion for wine, with the possible exception of the one amateur winemaker who says the Shallon guy rudely refused to talk details with him. But I digress. Among the few people I talked to, the Migration IPA was about 50-50 for and against. I never claimed to have the only worthwhile opinion in the world. Try it yourself, and if you like it I'm happy for you. I'll stick with the Black Mamba. I thought it needed some work. Nick and the rest of the Gilgfamesh crew that were there were friendly though. If you've had it I'd love to know what flavors you were getting. @Jared: I found it to be malty and fruity (risking the ridicule of Dr. Wort by using that term). Definitely got a hint of the tea.